Though one may take it as a sport for the young, and timid, skateboarding has grown into an extreme sport, enjoying a fan base that spans the globe. In the past, a skateboard was something that you bought your kids, so they could whizz down the streets, or take to the park on a weekend. Today, this sport has gained recognition, and several tournaments are held each year, where fans gather to watch the athletic ability of the participants. Skateboarding demands a lot of stamina, balance, agility, and bare guts, from the athletes. The courses that they have to maneuver seem impossible to the novice. One may ask, “How did that athlete manage to lift the board onto the railing of a staircase, slide down, and land perfectly at the bottom of the stairs?” This is due to the endless practice that these athletes have to endure to attain such performances. Any skateboarder will tell you of the injuries sustained as he or she tried to perfect his skills at this sport. Skateboarding is a very competitive sport. Athletes work hard at discovering new stunts, and also try to outdo each others time, at the courses. The variety of moves, that each athlete must exhibit, is what impresses both judges, and fans, alike. The X Games, and Gravity Games, are two avenues that have facilitated the growth of skateboarding as an extreme sport. Before the sport was transformed in the 90’s, people did not think of skateboarders as athletes. They viewed them as troublemaker, and thugs, who had natural talent for using a skateboard. Nobody though that it would become a sport, just like basketball, or baseball, until the late 90’s. It was at this time that the sport transformed into what it is today. You may wonder why the sport is categorized as an extreme sport; all you have to do is watch these athletes in action, and realize the danger that they expose themselves to, as they go through their individual repertoires. The unbelievable tricks that the skateboarders do, while 15 to 20 feet in the air, and the safe landing that they make, can boggle the mind. The athletes train rigorously, to condition their bodies to the demands of the sport. Going to the gym, training with weights, going for morning runs and stretching, are some of the training regimes that the athletes must adopt, to give them a competitive edge. What these young men and women do on a skateboard is uncanny, to say the least. 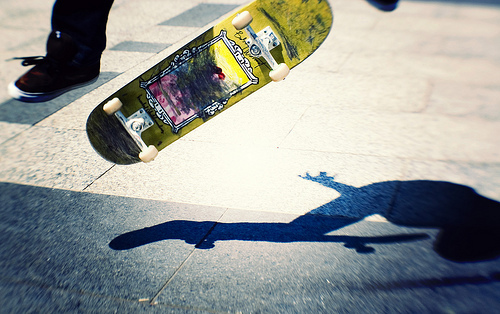 Skateboarding is a sport that requires style, during the execution of the daring stunts. Imagine launching yourself into the air, flipping your body, rotating the board using your feet, catching the board in your hands, returning the board under your feet, and then landing safely, to ride on to your next stunt. Some of these are done as a sequence with a very small gap in between. With this picture in mind, you will agree that skateboarding is one of the most exciting extreme games to watch. This entry was posted in Featured, Land Sports, Skateboarding and tagged Evolution, Extreme Sports, Skateboarding. Bookmark the permalink.